Overall nine of the Top 10 most watched programmes on Christmas Day were on RTÉ Television. RTÉ topped the ratings for Christmas 2012 as more of the Irish viewing public tuned in to RTÉ Television than any other station with Mrs Brown’s Boys proving to be a runaway success, taking top spots on both Christmas Eve and Christmas Day. RTÉ topped the ratings for Christmas 2012 as more of the Irish viewing public tuned in to RTÉ Television than any other station with 'Mrs Brown’s Boys' proving to be a runaway success, taking top spots on both Christmas Eve and Christmas Day. 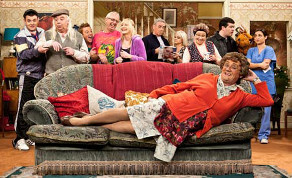 On Christmas Day the top-rated programme across all Irish channels was 'Mrs Brown’s Boys – The Virgin Mammy' on RTÉ One with an average of 972,000 viewers and a 47% share of all Irish viewers, while Mrs Brown’s Boys – Mammy Christmas hit the top spot for Christmas Eve viewing with an average of 851,000 viewers and 51% share. Overall nine of the Top 10 most watched programmes on Christmas Day were on RTÉ Television. 'RTÉ Six-One News' was the second most watched programme on Christmas Day with 580,000 viewers while 'Eastenders' on RTÉ One took the third spot with over 496,000 viewers. Home-grown drama was popular with Irish viewers on Christmas night as 'Fair City' pulled in 427,000 viewers putting it in sixth place. In seventh place the Christmas night 'RTÉ Nine O’Clock News' was watched by 392,000 viewers. And Ray D’Arcy’s special edition of 'School Around The Corner' proved popular with viewers attracting 316,000 to book the ninth spot. RTÉ’s movie premieres proved hugely popular with Up taking the fourth spot and 466,000 viewers, while 'It’s Complicated' had 383,000 viewers to put it in eighth place and 'Alice In Wonderland' ranked tenth with 252,000 viewers. On Christmas Eve, eight of the most watched programmes were on RTÉ Television. With Mrs Brown holding top spot, the second spot went to 'RTÉ Six-One News' with over 518,000 viewers. For 'One Night Only – Sharon Shannon' was ranked third with an average of 466,000 viewers. 'Eastenders' hit fifth position with 425,000 viewers and the ever popular 'Carols From The Castle' presented by Mary Kennedy came in at seventh spot with over 361,000 viewers. 'RTÉ News Nine O’Clock News' ranked eighth with 356,000 viewers. Comedy on RTÉ Two proved popular on Christmas Eve with the 'Father Ted Christmas Special' watched by 305,000 viewers. And movie favourite 'Home Alone' hit tenth spot with 260,000 viewers. St Stephen’s Day viewing showed a similar pattern with eight of the Top 10 programmes on RTÉ Television. Top spot went to 'RTÉ Six-One News' with 543,000 viewers, while 'Eastenders' came in third place with 460,000 viewers. 'The Zoo Christmas Special' proved popular with 429,000 viewers, ranking it in fourth place. 'RTÉ News Nine O’Clock News' hit fifth spot with 381,000 viewers. Movies took the remaining places in the Top 10 with 'Madagascar – Escape 2 Africa' in seventh place with 326,000 viewers, 'Four Christmases' ranked eighth with 315,000 viewers, 'The Sound of Music' at nine with 220,000 viewers and 'Johnny English' on RTÉ Two in tenth place overall at 201,000 viewers. All figures quoted refer to the average viewership on all Irish channels for National Individuals, Live + VOSDAL viewing. Source: TAM Ireland Ltd/ Nielsen TAM.